You know what? There aren’t enough steampunk stories. Doubly so for graphic novels. I mean who doesn’t love cool steam based tech and gorgeous Victorian outfits? Well, thankfully there’s the Lady Mechanika series. 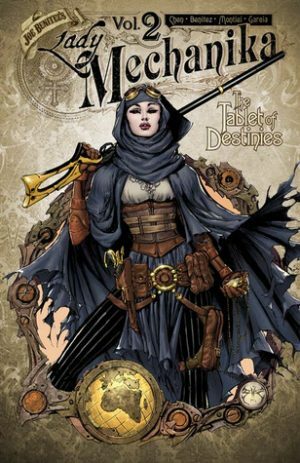 Lady Mechanika Vol 4 by Joe Benitez, M.M. Chen, Beth Sotelo, Michael Heisler, and Martin Montiel is a steampunk graphic novel series with detectives, fabulous lady investigators, and some scientists closer to the evil genius side of things than is comfortable. 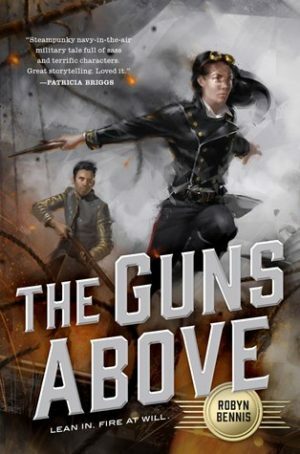 The Guns Above is the story of Josette Dupris, the first female captain of an airship in Garnia’s military. Usually, women in the military don’t make captain and aren’t allowed in battle. But the country is in the middle of a long war, and the death of Josette’s former captain mid-battle forced her hand. Now armed with her own ship, Josette has to navigate her first captain post, test out a brand new type of airship during airtime. Not everyone is happy with this new appointment, though. When a prominent general sends his nephew aboard to report back on Josette’s flaws in order to dismiss her from her new post, what will happen? 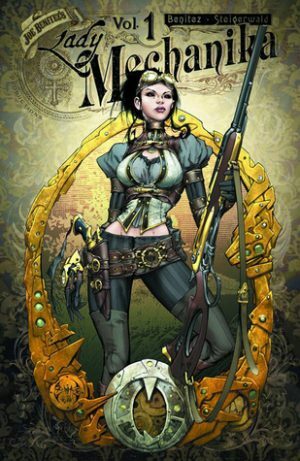 In my quest to read more graphic novels and not only manga I stumbled onto the Lady Mechanika series by Joe Benitez, a steampunk action series with beautiful character designs and gorgeous artwork. Lady Mechanika is a graphic novel series that I’ve been following for almost half a year now. The series is a steampunk, action packed story that follows the Lady Mechanika, a woman with mechanical limbs with no recollection of her past who solves problems that other people can’t. 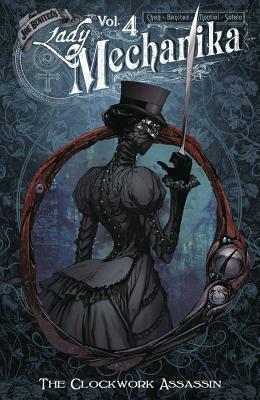 Lady Mechanika La Dama de la Muerte is a prequel of sorts, occurring before the start of the first volume of the graphic novel between the as yet unexplained origin. 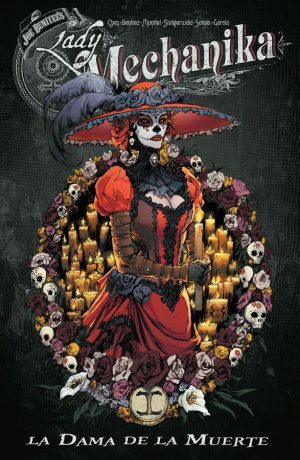 With breathtaking art and a story that is keeps you hooked, La Dama de la Muerte is another great addition to the series. 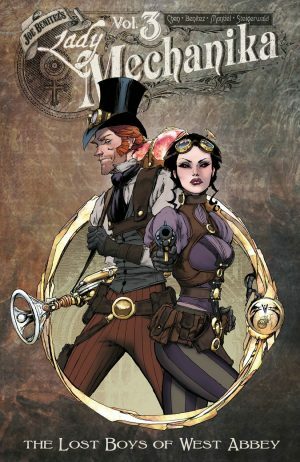 It wasn’t too long ago that I discovered the Lady Mechanika graphic novel series, and its one I’ve come to look forward to reading each time I find a new volume. When I had the opportunity to read an early copy of Lady Mechanika Vol. 3: The Lost Boys of West Abbey by M.M. Chen and Joe Benitez, I jumped on it. Sometimes it’s a synopsis that catches your eye. Sometimes it’s the cover. Sometimes it’s the author’s name, or the genre. For me, it was the setting the setting and cover design. 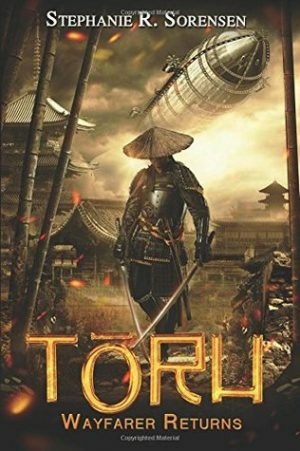 Toru: Wayfarer by Stephanie R. Sorensen is a book that’s been on my radar since it was first released back in February of 2016. When I finally got my hands on a copy, I was quite the excited bookworm. Unfortunately, the excitement didn’t last. Lady Mechanika, Vol. 1: Mystery of the Mechanical Corpse by Joe Benitez is a graphic novel series I wish I had picked up sooner. Of late I’ve read multiple stories promised strong female leads which just didn’t deliver, leaving me to spiral into despair that I’d never find a good female lead ever again. Then, behold! This beautifully illustrated graphic novel fell into my lap almost on accident. 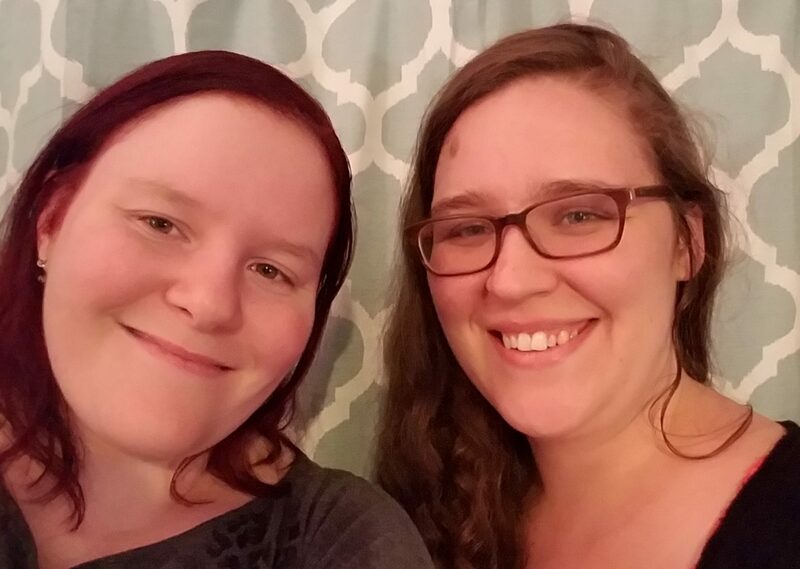 But did it quell my unyielding search for a better than average female protagonist?